What made the Savage Model 99 an innovative design, and why is it collectable today? Like Savage’s Model 1895, which preceded it, the Savage Model 99 was a hammerless lever-action rifle. It used a rotary magazine, which circumvented the issue of using cartridges with pointed bullets in a tubular-fed lever gun. Over its lifetime, the Model 99 was available in a wide array of calibers (including more modern ones), but the two most popular were the .250 Savage and the .300 Savage. Rifles chambered in some of the more obscure calibers are quite valuable in the collector’s market, with the .22 High Power commanding the highest values. The sleek and streamlined Savage Model 1895 looked like something out of the future when it appeared in the last decade of the 19th century. It was the first firearm produced by the Savage Repeating Arms Company, and its slim, flat, hammerless design was in sharp contrast to the popular, visible-hammer models available from Winchester and Marlin since the 1860s. The rounded profile let shooters know that something new in hunting rifles had arrived. The 1895 was unique in many respects. Its internal rotary magazine was the first of its type and was designed for cartridges with pointed bullets, unlike the tubular-fed Winchesters and Marlins that were limited to round-nose bullets. The Savage was also the first lever action with a coil mainspring, an improvement over the leaf springs on other brands. One of its advantages was a faster lock time. Another interesting feature was a hole in the top of the bolt that showed the status of the firing pin. A “C” was visible if the rifle was cocked, and an “F” indicated that the round had been fired. This opening apparently led to cleaning problems and was eliminated on the later Model 1899. Photo courtesy of Wayne Van Zwoll. Arthur William Savage was just 30 years old when he received a patent for his first rifle in 1887. It was a lever action with a small Martini-type lever meant to be operated with the shooter’s little finger. In 1892, a prototype of what was known as the Savage No. 1 with a 29-inch barrel and full-length stock was submitted to the Ordnance Trials for the military market. When the Krag-Jorgensen bolt action was chosen to be the U.S. Service Rifle, Savage went back to the drawing board and made a few changes to the rifle to make it more suitable for the civilian market. He received a patent in 1893 for this new design and then went on to develop a new cartridge, the .303 Savage with ballistics similar to the .30 WCF/.30-30 Winchester. At the time, Savage was a prominent citizen of Utica, New York, and was Superintendent of the Utica Belt Line Railroad. He put together a group of investors and founded the Savage Repeating Arms Company in 1894. The following year, the Model 1895 rifle went into production. Barrel lengths of 20, 26 or 30 inches were offered, either in round or half octagon/half round design and chambered only in .303 Savage. Only about 6,000 Model 1895s were made in its short 4-year life span, making it a rare and popular model among Savage collectors. Exact production numbers apparently do not exist. Some published sources say more than 8,000 were manufactured. The first Model 1895s were manufactured by the Marlin company, which also made the original tooling for the rifle. Savage was a new company and didn’t have the tooling or manpower to produce the guns, and Arthur Savage contracted with Marlin to make the 1895. These rifles are marked with “JM” for John Marlin on the barrel under the fore-end. Once again, Savage production files are sketchy. Some sources indicate that all 1895s were made by Marlin while others say it was only the first 5,000. The action and several other features were modified in 1899, and the Model 1899 was born. These included a cartridge indicator visible through a hole in the left side of the receiver to show remaining rounds. A cocking indicator consisting of a small bar on top of the bolt was added and replaced a few years later with a small pin that protruded through a hole atop the receiver. The original safety was located near the rear of the trigger and locked the lever and the trigger. In 1960, Savage placed a two-position thumb safety atop the rear of the receiver. Throughout its almost 100-year run, there were several iron sight variations. The Model 1895s were chambered for only one round, the .303 Savage. With the Savage Model 99, the .30-30 was added, plus several other Winchester calibers like the .25-35, .32-40 and .38-55. Later models were made in .22 Savage High Power (1912), and then the two most popular Model 99 chamberings for many years, the .250-3000 (1915) and .300 Savage (1920). This was about the time the official name of the model had become the Model 99. In the 1950s, more modern calibers were offered like the .243 Win., .308 Win., .358 Win. and .284 Winchester. It would also become available in 7mm-08 Remington and .375 Win. The Savage Model 99 became one of the most popular deer rifles in America, in part because of the excellent .250-3000 and .300 Savage cartridges that it introduced. As the first factory round to break the 3,000 feet-per-second (fps) velocity barrier, the .250-3000 received a lot of attention from outdoor writers. There were a few rather exaggerated claims about the killing power of high-velocity bullets on big game, but it was ideally suited for deer. The recoil was less than most other deer rifles of the day, and that made the fast little .250 a popular choice with many hunters for that reason. When the .243 and 6mm Remington came along in the 1950s, the .250 Savage — as its name had officially become — lost some of its sizzle, as did the similar .257 Roberts. But the .250 still has a place in the heart of many who know that for most deer hunting, it is all the gun you will ever need. The .30 caliber has long been an all-American favorite, and the .300 Savage fit neatly into the list of the .30s. It created a nice little niche between the .30-30 and .30-06, a position it held for more than 30 years, until the .308 Winchester came along in the ‘50s. To this day, like its little .250 brother, the .300 Savage remains an excellent cartridge for deer-size game at reasonable ranges. Some hunters believe the larger and heavier .300 bullet is a bit better in the brush than the lighter and faster .250, but that’s always been difficult to prove. Combination Cased Set .300 Savage/.410 Shotgun – Made from 1922 to 1934, the interchangeable shotgun barrel could only be used as a single shot because the rotary magazine was not designed for shotshells. Estimated value today, very good to excellent condition: $2,000 to $4,000. Model 99K – The highest grade 99 with engraved receiver and high-grade walnut stock. President Franklin Roosevelt presented one of these in the 1940s to the Shah of Iran Mohammad Reza Pahlavi, a renowned big-game hunter. Estimated value: $2,500 to $3,000. Model 1899-D Military Musket – Made from 1899 to 1915, including several hundred for the Canadian Home Guard during World War I. In .303 Savage with a 28- or 30-inch barrel with two barrel bands and a full-length military stock. Estimated value: $5,000 to $6,000. Model 99-H Carbine – Made in .250 Savage, .300 Savage, .303 and .30-30 from 1923 to 1940 with a curved, carbine-style buttplate. Later models had a barrel band on the fore-end and a ramp front sight. Estimated value: $800 to $1,200. Many other variants were produced in the period from the 1960s to the 1990s and can be found on the used gun market in the $400 to $800 price range, not collector’s items but solid, serviceable hunting rifles. The rarest calibers are the .22 Hi Power, .25-35, .32-40, .38-55, .284 Win. and .375 Win. Expect to pay a premium for these, up to 100 percent for the .22 High Power. The last Savage Model 99 came off the assembly line 20 years ago, in 1997. Why Savage didn’t keep it going for another couple of years is anyone’s guess, but it probably had something to do with the cost of production. As a fan of the rifle, I remember looking forward to seeing a 100th Anniversary edition, but it was never to be. 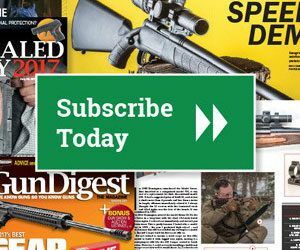 Editor’s Note: This “Collector’s Corner” column is an excerpt from the August 2017 issue of Gun Digest the Magazine.